NOTE: Laurie Mylroie, formerly of Harvard University and the U.S. Naval War College, is currently with the Foreign Policy Research Institute of Philadelphia. She was co-author of the bestseller, Saddam Hussein and the Crisis in the Gulf (Random House 1990), and has just completed a sequel, 'Study of Revenge': Saddam's Terror Against America. ACCORDING TO THE presiding judge in last year's trial, the bombing of New York's World Trade Center on February 26, 1993 was meant to topple the city's tallest tower onto its twin, amid a cloud of cyanide gas. Had the attack gone as planned, tens of thousands of Americans would have died. Instead, as we know, one tower did not fall on the other, and, rather than vaporizing, the cyanide gas burnt up in the heat of the explosion. "Only" six people died. Few Americans are aware of the true scale of the destructive ambition behind that bomb, this despite the fact that two years later, the key figure responsible for building it--a man who had entered the United Stares on an Iraqi passport under the name of Ramzi Yousef--was involved in another stupendous bombing conspiracy. In January 1995, Yousef and his associates plotted to blow up eleven U.S. commercial aircraft in one spectacular day of terrorist rage. The bombs were to be made of a liquid explosive designed to pass through airport metal detectors. But while mixing his chemical brew in a Manila apartment, Yousef started a fire. He was forced to flee, leaving behind a computer that contained the information that led to his arrest a month later in Pakistan. Among the items found in his possession was a letter threatening Filipino interests if a comrade held in custody were not released. It claimed the "ability to make and use chemicals and poisonous gas... for use against vital institutions and residential populations and the sources of drinking water." Quickly extradited, he is now in U.S. custody awaiting trial this spring. Ramzi Yousef's plots were the most ambitious terrorist conspiracies ever attempted against the United States. But who is he? Is he a free-lance bomber? A deranged but highly-skilled veteran of the Muslim jihad against the Soviets in Afghanistan? Is he an Arab, or of some other Middle Eastern ethnicity? Is there an organization--perhaps even a state--behind his work? These questions have an obvious bearing not only on past events but on possible future ones as well. It is important to know who Ramzi Yousef is and who his "friends" are, because if he is not just a bomber-for-hire, or an Islamic militant loosely connected to other Muslim fundamentalists, Yousef's "friends" could still prove very dangerous to the United States. It is of considerable interest, therefore, that a very persuasive case can be made that Ramzi Yousef is an Iraqi intelligence agent, and that his bombing conspiracies were meant as Saddam Hussein's revenge for the Gulf War. If so, and if, as U.S. officials strongly suspect, Baghdad still secretly possesses biological warfare agents, then we may still not have heard the last from Saddam Hussein. This essay will focus on three points. First, it will argue that, as things stand now, coordination between the Justice Department and the relevant national security agencies is such that the latter--and thus national security itself gets very short shrift when it comes to dealing with terror incidents perpetrated on U.S. soil. Second, it will look afresh at the evidence from the World Trade Center bombing case and suggest that the most logical explanation of the evidence points to Iraqi state sponsorship. Third, it will assay briefly what dangers the Iraqi regime may still pose to the United States should this analysis prove correct. THE SUGGESTION THAT Iraq might well have been behind Ramzi Yousef's exploits may initially strike many as implausible. Wouldn't the U.S. government investigation of the World Trade Center bombing have uncovered evidence to that effect, evidence that the press, in turn, would have broadcast far and wide? Wouldn't America's robust anti-terrorist intelligence capacities have focused on such suspicions long ago? In effect, the Justice Department puts the prosecution of individual perpetrators--with all the rights to a fair trial guaranteed by the U.S. judicial system--above America's national security interest in determining who may be behind terrorist attacks. Questions of state sponsorship that are of pressing interest to national security agencies are typically relegated to a distant second place, or never properly addressed at all, because the national security agencies are denied critical information. In particular, whenever early arrests are made regarding a terrorist incident on American soil, the U.S. government cannot properly address both the national security question of state sponsorship and the criminal question of the guilt or innocence of individual perpetrators at the same time. This is precisely what happened in the World Trade Center bombing. In the case of Ramzi Yousef, the perfectly reasonable questions posed above about who this man is and who may sponsor him have never been properly investigated. Instead of the appropriately trained people conducting a comprehensive investigation, the World Trade Center bombing was followed by an undercover operation, in which an informant of dubious provenance led a handful of local Muslims in a new bombing conspiracy, aimed at the United Nations and other New York landmarks. For this conspiracy Sheikh Omar Abdul Rahman and nine others were found guilty in early October 1995. Yet none of those in the trial of Sheikh Omar et al., as it is formally called, was accused of actually participating in the World Trade Center bombing. They were only charged with conspiracy regarding it. The government contended that other followers of Sheikh Omar--four fundamentalists who stood trial in 1994--were actually responsible for putting it into effect. But what if Ramzi Yousef, who eluded the grasp of U.S. authorities until after his second bombing conspiracy, is neither a follower of Sheikh Omar nor a Muslim fundamentalist? That if he is an Iraqi agent? From a legal perspective--as the judge in that trial advised the defense team--whether state sponsorship played a role in the World Trade Center bombing was irrelevant to the guilt or innocence of Sheikh Omar et al. And indeed, the prosecution did not need to address the question of whether the World Trade Center bombing had state sponsorship in order to obtain the convictions sought against Sheikh Omar and the others. Indeed, that state sponsorship can be irrelevant to a criminal prosecution was explained most clearly by the federal prosecutors in the New York bombing conspiracies, the lead prosecutor in the trial of Sheikh Omar et al., and the lead prosecutor in last year's Trade Center bombing trial, who will also prosecute Ramzi Yousef. When I put it to them that Iraq was probably behind the Trade Center bombing, they replied, "You may be right, but we don't do state sponsorship. We prosecute individuals." Asked who does "do" state sponsorship, they answered, "Washington." "Who in Washington?" No one seemed to know. Yet by responding to state-sponsored terrorism solely by arresting and trying individual perpetrators, the U.S. government, in effect, invites such states to commit acts of terror in such a way as to leave behind a few relatively minor figures to be arrested, tried, and convicted. Done adroitly, this makes it unlikely that the larger, more important, and more difficult question of state sponsorship will ever be addressed. The problem is illustrated vividly in the case of Ramzi Yousef since his arrest in February 1995. The Justice Department has passed on very little information to other bureaucracies. The FBI's typical response to any question about Yousef is: "We can't tell you much because of the trial." As a result, the State Department, which is responsible for determining whether a terrorist act had state sponsorship, lacks the most basic information-- even, for example, a point as simple as what passport Yousef was traveling on when he was arrested in Islamabad. The details of the World Trade Center case are chilling. From the outset, the Justice Department refused to share key information with the national security agencies. The government had two sets of relevant information--foreign intelligence, gathered by the CIA from watching terrorist states such as Iran and Iraq, and evidence gathered by the FBI largely within the United Stares for use in the trial. The FBI flatly told the national security bureaucracies that there was "no evidence" of state sponsorship in the World Trade Center bombing. When the national security agencies asked to see the evidence themselves, the FBI replied, "No, this is a criminal matter. We're handling it." Thus, all that the national security agencies had available to decide the question of state sponsorship was foreign intelligence they themselves had collected. But many cases of stare-sponsored terrorism cannot be cracked by means of intelligence alone. The crucial element linking the bombing of Pan Am flight 103 to Libya, for example, was not intelligence but a piece of physical evidence--a microchip, part of the bomb's timing device, that could be tied to other bombs built by Libyan agents. After the World Trade Center bombing, the FBI was the only bureaucracy with both the intelligence and the evidence. Even if the FBI did make a serious effort to examine the evidence for state sponsorship--and it is not clear that it did--the Bureau alone is not competent to carry out such an investigation. "They're head hunters", one official in Pentagon Counterterrorism remarked--that is, they are oriented to the arrest of individuals. A State Department expert described the FBI's new Office of Radical Fundamentalism as "a joke", bereft of any genuine Middle East expertise. But the more fundamental problem is that the Justice Department in Washington seems not to have been interested in pursuing the question of state sponsorship. In fact, the New York FBI office suspected an Iraqi connection early on, but the Washington brass seemingly wanted to tell America that they had already cracked the case and caught most of the perpetrators. It is always easier to go after the small fry than to catch the big fish, and law enforcement is ever vulnerable to the temptation to cut off a conspiracy investigation at the most convenient point. Thus, five weeks after the World Trade Center bombing, four Arabs were under arrest. The mastermind, Ramzi Yousef, had fled. Still, at that point in early April 1993, the FBI proclaimed that it had captured most of those involved. The bombing, it claimed, was the work of a loose group of fundamentalists with no ties to any state. The predictable media frenzy followed and, perhaps as a result, some obvious questions were not asked. How could the government know so early in the investigation that those it had arrested had no ties to any state? If the government knew so much so soon, then why did one of those arrested never stand trial for the bombing, and why were three others indicted much later? In short, the Justice Department determined that the bombing had no state sponsorship even before it decided definitively who had been involved. Moreover, by April it was impossible to have conducted a sufficiently thorough investigation. Such an investigation required, at a minimum, a meticulous examination of all records associated with the defendants to insure that they had had no contact with foreign intelligence agencies--or at least that none could be found. That process simply could not have been accomplished in five weeks. And it must be kept in mind that, at the time, the mastermind of the bomb was a fugitive about whom almost nothing was known. How could anyone therefore declare confidently that he was not a foreign agent, especially in light of the fact that he had entered the United States on an Iraqi passport and had been known among the New York fundamentalists as "Rashid, the Iraqi"? Ironically, this sort of problem would not have arisen had the bombing occurred abroad. In such cases there are usually two separate investigations by two different bureaucracies, one to determine state sponsorship, the other to catch the individuals responsible. After the bombing of Pan Am 103, for example, the CLA led an inter-agency intelligence investigation addressing the question of state sponsorship. There was also a separate criminal investigation, headed by the FBI, aimed at individual perpetrators. But there was no intelligence investigation of the World Trade Center bombing. The CIA is, after all, prohibited from operating in America. Of course, a crack inter-agency team could have been established to examine the question of state sponsorship. But Clinton administration officials set up no such team. In September 1995, the State Department forwarded to Congress the report of an independent panel, established to examine whether mistakes in security training had contributed to the March 8 assassination of two U.S. consular officials in Karachi--apparent retaliation for Ramzi Yousef's extradition. The report expressed concern about the FBI's lack of cooperation with the national security agencies. Clearly, discontent with the FBI is growing among those agencies as issues such as international crime--and with them the Bureau's international role--assume a mare prominent role in the post-Cold War world. Indeed, one State Department official described the FBI'S unwillingness to share information as "the train wreck coming"--meaning that given the FBI's lack of expertise in international politics, there may well come a time when the Bureau will be sitting on information that, in the hands of others, could have been used to avert a disaster. One may indeed ask whether the World Trade Center bombing itself is not a harbinger of the train wreck coming. For if Saddam Hussein was behind it, then the Justice Department, in effect, has blinded the national security bureaucracies to a serious danger, namely the possibility that in the extreme Iraq might use biological agents, whether for terrorism in America or in the context of military' action in the region, possibly involving U.S. troops. Of course, that is an important "if." It is to that issue we now turn. Ramzi Yousef, a.k.a. Abdul Basit Karim -the key man; likely Iraqi agent. El Sayid Nosair--murderer of Rabbi Meir Kahane, bomb plot initiator. Emad Salem--FBI informant with ties to Egyptian intelligence. Mohammed Salameh--Palestinian fundamentalist, Nosair accomplice and early plotter; left a trail of phone calls to Iraq. Musab Yasin--Iraqi with New Jersey apartment where Yousef first went. Abdul Rahman Yasin--Musab's brother, led FBI to apartment where bomb was made; employee of Iraqi government; indicted fugitive, presently in Baghdad. Nidal Ayyad--Palestinian fundamentalist convicted in the World Trade Center bombing. Eyyad Ismail--Palestinian from Jordan charged with having driven the van. ALTHOUGH THE national security agencies never received the World Trade Center evidence, at the conclusion of a trial evidence becomes public. Anyone can examine it, and I did so meticulously. The raw data consist mostly of telephone records, passports, and airplane tickets. Such data reveal nothing directly about state sponsorship, but under close analysis certain facts begin to stand out and certain patterns emerge. And it helps to know the Middle East well. The story begins in November 1990 when an Egyptian fundamentalist, El Sayid Nosair, shot and killed Meir Kahane, an extreme right-wing Israeli-American, in Manhattan. A year later, in November 1991, Nosair's trial became a cause celebre among local fundamentalists, who turned out in force to support their "martyr." Planted among them was an Egyptian, Emad Salem, working as an FBI informant, even as he maintained ties to Egyptian intelligence. In December, the jury returned a bizarre verdict, acquitting Nosair of murder and finding him guilty on lesser charges. An outraged judge gave Nosair a maximum sentence on those lesser charges, and sent him to Attica. The fundamentalists continued to support Nosair, arranging bus trips from their mosques to visit him in prison. Salem, the FBI plant, remained among them. In early June 1992, with Salem acting as an agent provocateur, Nosair convinced his friends to execute a bomb plot. He wanted them to make twelve pipe bombs, to be used for assassinating his judge and a Brooklyn assemblyman, the others to be used against Jewish targets. A cousin was to organize the plot, and Salem was to build the bombs. A twenty-six year old Palestinian, Mohammad Salameh, was soon recruited into the plot. Salameh comes from a long line of terrorists on his mother's side. His maternal grandfather fought in the 1936 Arab revolt against British rule in Palestine, and even as an old man joined the PLO and managed to get himself jailed by the Israelis. A maternal uncle was arrested in 1968 for terrorism and served eighteen years in an Israeli prison before he was released and deported, making his way to Baghdad where he became number two in the "Western Sector", a PLO terrorist unit under Iraqi influence. Despite this pedigree, Salameh himself is naive and manipulable. When one considers that he was arrested in the process of returning to collect the deposit on the van he had rented to carry the Trade Center bomb, it is not so surprising that on June 10, soon after being recruited into Nosair's plot, Salameh made the first of forty-six calls to Iraq, the vast majority to his terrorist uncle in Baghdad. We can only speculate about what Salameh told his uncle, but it seems very likely that he spoke about the bold new project Nosair was organizing, perhaps seeking his help and advice. Salameh's telephone bills suggest that the pipe bombing plot was one of the most exciting events in his life: In six weeks he ran up a bill of over four thousand dollars and lost his phone service. Iraq is one of the few remaining Stalinist states. Iraqis routinely assume their telephones are bugged, and are even cautious about discussing sensitive issues in their own homes. The more significant the person, the greater the likelihood his activities are monitored--at least that is what Baghdadis assume. My own experience in Baghdad makes clear that when Iraqis want to be sure that a conversation is not monitored, it takes place out of doors. It is thus more than likely that Iraqi intelligence learned of Nosair's bombing plot and Salameh's participation in it through Salameh's phone calls to his uncle. In any event, key preparatory steps to the World Trade Center bombing were taken within days of Salameh's first call-including steps taken in Baghdad. On June 21, an Iraqi living in Baghdad, Abdul Rahman Yasin (subsequently an indicted fugitive in the Trade Center bombing) appeared at the U.S. embassy in Amman asking for a U.S. passport. Born in America, Abdul Rahman received his passport, which he soon used to travel to this country. Just at this crucial point, unfortunately, the FBI lost track of the Nosair-Salameh conspiracy. It did not fully trust its informant, Emad Salem, and Salem's ties to Egyptian intelligence; the Bureau severed relations with him in early July when he refused to follow its procedures relating to criminal investigations. Salameh's phone bills and other evidence raise the distinct possibility that, Iraqi intelligence having learned of Nosair's plans from Salameh's calls to his uncle, Baghdad decided to help out, transforming the plot in the process. If so, the speed of the reaction suggests that Iraqi intelligence may have already been planning some operation against America, and that Salameh1s calls to his uncle provided it with a fortuitous means of carrying it out. Here probably lies the source of Ramzi Yousef s exploits in America. Musab lived in the same building as Mohammad Salameh. Many young Arab men used their two apartments, praying and eating together; relations were so close that the apartments were connected by an intercom. Once established within this group, Ramzi Yousef befriended Salameh, and the two left to share an apartment elsewhere in Jersey City. From then on, the impressionable Salameh was under Yousef's wing. Although the principal conspirators had been in place since September, it was not until after the U.S. elections on November 3 that Yousef began to prepare the World Trade Center bomb. In mid-November the first of many calls to chemical companies appears on his phone bills. At the same time, Yousef also began calling surgical supply companies for the gloves, masks, and rubber tubing he needed to make the bomb. In the meantime, two other local fundamentalists were recruited into the plot, Nidal Ayyad and Mahmud Abu Halima. Ayyad, a Palestinian, was the same age as Salameh and Salameh's friend. Abu Halima, a thirty-four year old Egyptian cab driver, was a friend of Nosair. Abu Halima was older and generally savvier than the two Palestinians. In January 1993, Yousef and Salameh moved into another Jersey City apartment where the bomb was actually built. Set well back from the street, the building provided seclusion. On February 21 a twenty-one year old Palestinian named Eyyad Ismail arrived from Dallas. Ismail is charged with having driven the bomb-laden van. On February 23, Salameh went to a Ryder rental agency to rent the van to carry the bomb. On the morning of February 26, the conspirators gathered at a local Shell gas station where they topped up the tank--one last explosive touch--before driving to Manhattan. Shortly after noon, the bomb went off, on--let it be well noted--the second anniversary of the ending of the Gulf War. That evening Salameh drove Yousef and Ismail to JFK airport; Yousef escaped to Pakistan on falsified travel documents, and Ismail flew home to Jordan. But Salameh looks to have been deliberately left behind by Yousef, not provided with money he needed for a plane ticket. Salameh had a ticket to Amsterdam on Royal Jordanian fight 262, which continues on to Amman, dated for March 5, but it was an infant ticket that had cost him only $65. While Salameh had been able to use this ticket to get himself a Dutch visa, he could not actually travel on it. Needing more money for an adult fare, he tried to get his van deposit back by telling the rental agency that the van had been stolen. With either desperate or inane persistence, he returned three times before he was finally arrested on March 4. Salameh had used Musab Yasin's phone number when renting the van, and Abdul Rahman Yasin was picked up the same day in a sweep of sites associated with Salameh. Abdul Rahman was taken to New Jersey FBI headquarters in Newark. He is reported to have been extremely cool, as a trained intelligence agent would be. He was helpful to investigators who themselves faced tremendous pressure to produce answers. He told them, for instance, the location of the apartment that was used to make the bomb, a key bit of information. They thanked him for his cooperation and let him walk out. This, although he had arrived just six months before from Iraq, and might well attempt to return there. And indeed, the very next day, Abdul Rahman Yasin boarded Royal Jordanian 262 to Amman, the same plane Salameh had hoped to catch. From Amman he went on to Baghdad. An ABC news stringer saw him there last year, outside his father's house, and learned from neighbors that he worked for the Iraqi government. That, indeed, is the most straightforward explanation of the World Trade Center bombing: that it was an Iraqi intelligence operation, led by Ramzi Yousef, with the local fundamentalists serving first as aides and then as diversionary dupes. Since Yousef's arrest and extradition to the United States, the evidence for this explanation has, if anything, grown stronger. First of all, he is clearly no fundamentalist. According to neighbors, he had a Filipina girlfriend and enjoyed Manila's raucous night life. Yousef's nationality and ethnicity have also become known. He is a Pakistani Baluch. The Baluch are a distinct ethnic group, speaking their own language, one of several Middle Eastern peoples without their own homeland. They live in eastern Iran and western Pakistan in inhospitable desert terrain over which neither Tehran nor Islamabad exercises much control. Baluchistan is a haven for smuggling, both of drugs and of arms. The Baluch are Sunni and are at sharp odds with Tehran's Shia clerical regime. Through Iraq's many years of conflict with Iran, first in the early 1970s and then during the Iran-Iraq war a decade later, Iraqi intelligence developed close ties with the Baluch on both sides of the Iranian-Pakistani border. Above all, it used them to carry out terrorism against Iran. THE SINGLE MOST important piece of evidence pointing to Iraq is the passport on which Yousef fled America. It was no ordinary passport. On November 9,1992, just after the final green light for the bombing had been given, Yousef reported to Jersey City police that he had lost his passport. He claimed to be Abdul Basit Mahmud Abdul Karim, a Pakistani born and reared in Kuwait. Then, between December 3 and December 27, Yousef made a number of calls to Baluchistan. Several of them were conference calls to a few key numbers, a geographical plotting of which suggests that they were related to Yousef's probable escape route--through Pakistani and Iranian Baluchistan--across the Arabian Sea to Oman, after which the "telephone trail" ends. After Yousef's arrest, a National Security Council staffer confirmed to me that Yousef had indeed fled from the United States through Baluchistan. On December 31, 1992, Yousef went to the Pakistani consulate in New York with photocopies of Abdul Basit's current and previous passports. Consistent with his story to police in Jersey City, he claimed to have lost his passport and asked for a new one. The consulate suspected his non-original documentation enough to deny him a new passport. But it did provide him a six-month, temporary passport and told him to straighten things out when he returned "home." This turned out to be good enough for the purpose at hand. By now it should be clear that the World Trade Center bomber's real name is probably neither Ramzi Yousef nor Abdul Basit. After all, would someone intending to blow up New York's tallest tower go to such trouble to get a passport under his own name? Yousef was a man of many passports; he had three on his person when he was arrested in Pakistan. Rather, it seems that Ramzi Yousef risked going to the Pakistani consulate with such flimsy documents because he wanted investigators to conclude that he was in fact Abdul Basit, and so would stop trying to determine his real identity. And that is pretty much what happened. But why Abdul Basit Karim? Here we come to one of the most intriguing and vital aspects of the case. Because there really was an Abdul Basit Karim, a Pakistani born in Kuwait, who later attended Swansea Institute, a technical school in Wales. After graduating in 1989 with a two-year degree in computer-aided electronic engineering, he returned to a job in Kuwait's planning ministry. As Abdul Basit and his family were permanent residents of Kuwait, Kuwait's Interior Ministry maintained files on them. But the files for Abdul Basit and his parents in Kuwait's Interior Ministry have been tampered with. Key documents from the Kuwaiti files on Abdul Basit and his parents are missing. There should be copies of the front pages of the passports, including a picture, a notation of height, and so forth, but that material is gone. There is also information in the file that should not be there, especially a notation stating that Abdul Basit and his family left Kuwait for Iraq on August 26, 1990, transiting to Iran at Salamchah (a crossing point near Basra) on their way to Pakistani Baluchistan, where, according to the file, they now live. Who put that notation into Abdul Basit's file and why? Consider the circumstances of the moment. The Kuwaiti government had ceased to exist, and Iraq was an occupation authority; bent on establishing control over a hostile population amid near-universal condemnation, as an American-led coalition threatened war. The situation was chaotic as hundreds of thousands of people were fleeing for their lives. While the citizens of Western countries were pawns in a high stakes game, held hostage by Iraq, little attention was paid to the multitude of Third World nationals bent on escape. It truly boggles the imagination to believe that under such circumstances an Iraqi bureaucrat was sitting calmly in Kuwait's Interior Ministry taking down the flight plans--including the itinerary and final destination--of otherwise non-descript Baluchis fleeing Kuwait. Rather, it looks as if Iraqi intelligence put that information into Abdul Basit's file to make it appear that he left Kuwait rather than died there, and that, like Ramzi Yousef, he too was Baluch. Moreover, Iraqi intelligence apparently switched fingerprint cards, removing the original with Abdul Basit's fingerprints and replacing it with one bearing those of Yousef. Fingerprints are decisive for investigators because no two people's match. But the very fact that fingerprints are so decisive makes them the perfect candidate for careful manipulation. Thus, after U.S. authorities learned that Yousef had fled as Abdul Basit, they sent his fingerprints (taken by the Immigration and Naturalization Service at JFF airport when he was briefly detained for illegal entry) to Kuwait, asking if they matched those of Abdul Basit. When the Kuwaitis said that they did, everyone assumed the question settled--forgetting that Kuwait's files were not secure during the Iraqi occupation. Pakistan also maintains files on those of its citizens permanently resident abroad, at the embassy in the country in which they live. On August 9, Baghdad ordered all embassies in Iraq's "nineteenth province" to close. Most did, including the Pakistani embassy. The files on Abdul Basit and his family that should be in the Pakistani embassy in Kuwait are missing. The Pakistani government now has no record of the family. What does all this suggest? To me it suggests that Abdul Basit and his family were in Kuwait when Iraq invaded in August 1990; that they probably died then; and that Iraqi intelligence then tampered with their files to create an alternative identity for Ramzi Yousef. Clearly, only Iraq could reasonably have: 1) known of, or caused, the death of Abdul Basit and his family; 2) tampered with Kuwait's Interior Ministry files, above all switching the fingerprint cards; and 3) filched the files on Abdul Basit and his family from the Pakistani embassy in Kuwait. Of course, the best way to verify or falsify this would be to check with people who knew Abdul Basit before August 1990. To this end, Brad White, a former Senate Judiciary Committee investigator and CBS newsman, contacted an overseas source he knew in the United Kingdom who had looked into the matter. Two people had a good memory of Abdul Basit but, shown photos of Yousef, were unable to make a positive identification. They both felt that while there was some similarity in looks, it was not the same person. "Our feeling is that Ramzi Yousef is probably not Basit", White was told. And where are Abdul Basit's parents? They never returned to Kuwait after its liberation, nor have they appeared anywhere else. Did they too take up a life of crime after decades of abiding by the law? Is "Ramzi Yousef" really Abdul Basit or not? Let those who remember Abdul Basit from before August 1990 meet Yousef in person and tell us. It sounds simple and logical, but strangely, the Justice Department has shown no interest in arranging such a meeting. Moreover, it has decided to try, the bomber as Ramzi Yousef even though no one, including Yousef by now, maintains that that is his real name. If the government believes that Yousef is really Abdul Basit, why doesn't it try him as Abdul Basit? Why is the Justice Department uninterested even in definitively determining his identity, even though doing so might help get to the bottom of the matter. I recently asked a Justice Department official, who maintains his confident view that Yousef is indeed Abdul Basit, "Why don't you bring the people who knew Abdul Basit to the prison to meet Yousef, so they can say for sure if they are the same?" "But you", I was told, "are interested in an intelligence question." Earlier I had been told, "It does not matter what we call him. We just try a body." And so back we come to the high wall. As before, those who have the information about Ramzi Yousef and his bombing conspiracies are not concerned with the question of state sponsorship, or at least consider it secondary to their trials; while those who are concerned with state sponsorship are denied the information that they need to investigate the question properly. MOST MEMBERS OF the U.S. national security bureaucracies think that Saddam Hussein has largely lain low since the Gulf War, constrained by economic sanctions and swift American reactions to his occasional feints to the south. But if in February 1993, Saddam ordered his agents to try to topple New York's tallest tower onto its twin, and if, in January 1995, Iraq sponsored an effort to destroy eleven U.S. airplanes in the Far East, then Saddam has not been quiescent. This, simply put, is why it is important to find out who Ramzi Yousef is and who may have put him up to his murderous work. Maybe Iraq had nothing to do with him, despite all the circumstantial evidence suggesting otherwise. But if it did, then the otherwise peculiar, bombastic, and extremely violent statements emanating from Baghdad might make more sense than they at first seem to. In the fall of 1994, Baghdad's official press, in essence, threatened that Saddam might use his remaining unconventional agents, biological and chemical, for terrorism in America, or in missiles delivered against his enemies in the region if and when he became fed up with sanctions. On September 29, 1994, following an otherwise cryptic statement of Saddam Hussein's, the government newspaper, Babil, warned: "Does the United States realize the meaning of every Iraqi becoming a missile that can cross to countries and cities?" We seek to tell the United States and its agents that the Iraqi patience has run out and that the perpetuation of the crime of annihilating the Iraqis will trigger crises whose nature and consequences are known only to God. These statements occurred in the context of Saddam's second and abortive lunge at Kuwait, which was thwarted by the swift U.S. deployment to the region. Saddam then turned around and formally recognized Kuwait, removing what then seemed to be the last major obstacle to lifting sanctions, and the Iraqi press soon began to call 1995, "the year of lifting sanctions." After Baghdad succeeded in getting a clean bill of health from UNSCOM in mid-June on its chemical and missile programs, it finally acknowledged in July having had an offensive biological program and having produced anthrax and botulinim. But it denied that it had ever tried to weaponize those agents and, in any case, claimed to have destroyed them in the fall of 1990. The claim was neither credible nor verifiable, particularly as Iraq produced no documents detailing their destruction. Indeed, the Iraqi "revelations" may even have been meant as a threat, an attempt to intimidate the United Nations by hinting at what Baghdad was still capable of doing. In early August 1995, as Iraq pressed UNSCOM for a clean bill of health on its biological program, Hussein Kamil--Saddam's cousin and son-in-law, and the man responsible for overseeing the build-up of Iraq's unconventional weapons program defected. This precipitated a flood of stunning revelations from Baghdad. They included the admission that Iraq had indeed weaponized botulinim and anthrax. At the very same time that it had earlier claimed to be destroying those agents, the Iraqi regime now acknowledged that it had been stuffing them into bombs and missiles. Yet Iraq still claimed that whatever biological agents it had produced had been destroyed, even as it still failed to produce any documents to confirm their purported destruction. Would Saddam actually do such a thing? When asked about the possibility of Saddam's using biological agents for terrorism in America, UNSCOM chairman RoIf Ekeus replied, "It is obviously possible." Yet such thoughts seem far from the minds of most U.S. officials, who believe that Saddam is trapped by sanctions and can do no real harm. They feel no urgency about bringing Saddam down; they sense no danger. YET IF RAMZI YOUSEF is in fact an Iraqi intelligence agent, there obviously is a danger. Even if we cannot yet be absolutely certain of this, so many American and allied lives are potentially at stake that it seems the least a responsible government can do is to make every reasonable effort to find out. As Saddam Hussein senses his ever-increasing isolation and sees the prospects for lifting sanctions receding, his desperation may lead him to order other, and even more ghastly, deeds. If Saddam Hussein still hungers for revenge, the question of Ramzi Yousef's terrorism is much too important to be left solely to the Justice Department, while the FBI continues to withhold critical information from the national security bureaucracies. 1. Bring those who knew Abdul Basit Karim before August 1990 to meet Yousef in prison and pronounce definitely if they are one and the same man. 2. Demand the immediate and unconditional extradition of Abdul Rahman Yasin from Baghdad. 3. Establish a "tiger team", drawn from the best and brightest within the national security bureaucracies, to examine all the information in the U.S. government's possession related to Yousef and his bombing conspiracies. Yousef's apparent use of chemical agents in New York and his threat to use them in the Philippines deserve special attention. 4. Establish appropriate procedures so that whenever a terrorist attack occurs against U.S. targets that might be state-sponsored, a qualified team will address the question of state sponsorship regardless of whether the terror occurs on U.S. soil or whether early arrests are made. Individually, the pieces of this puzzle--the elusive identity and affiliation of the World Trade Center bomber; the series of explicit threats against the United States issuing from Baghdad; the question of Iraqi biological capabilities--raise troubling questions. Taken together, they provide the outline of a very frightening possibility. The lack of coordination between the Departments of Justice and State may have created a niche for terrorism within America's borders; while the lack of any adequate response to the two major bombing conspiracies may have already begun to undermine the credibility of the threat of deterrence. So far, State Department officials have been content to leave the issue of Iraq's possible resort to biological terrorism on the back burner, secure in the belief that the threat of nuclear retaliation will be sufficient deterrent. But Saddam has previously miscalculated the American reaction to his provocations. It would be reassuring to know that, somewhere in the policy-apparatus of the State Department, someone is looking seriously at the possibility of future terrorist acts and at the requirements of effective deterrence. 1. Washington Post, October 7,1995. 2. Indeed, there is good reason to suspect an Iraqi hand in the November 13,1995 bombing of the U.S. military office in Riyadh. 3. Interview with Vincent Cannistraro, former Chief of Counterterrorism Operations for the CIA's Counterterrorism Center. There is no formal or legal reason for the FBI position and standard practice. It is largely a matter of protecting bureaucratic turf. 4. Wall Street Journal, September 22,1995. This point was repeatedly made in the New York Times--April 4,7, 9 and 26; June 22 and 28; July 26 and 30; August 2 and 22; October 2, 1995. 5. Ken Wasserman, lawyer for one of the defendants in Sheikh Omar et. al. to the author. 8. lsmail was indicted in September 1994 and arrested in August 1995 at his family home in Jordan. He was identified by comparing Yousef's telephone records to the passenger manifests of planes leaving JFK the night of the bombing. I believe that Ismail was probably an unwitting participant and meant to be caught. After Yousef was arrested in February, he mentioned the existence of another conspirator and expressed surprise that he had not yet been arrested. 9. John Anticev to FBI plant Emad Salem. Salem taped most of his phone conversations, including those with the FBI. 10. FD-302, [Proffer Session], p.3, Mohammad Abdul Haggag. 11. New York Times, February 12,1995. 12. See Charles Wallace, Los Angeles Times, May 30, 1995; David Ottaway and Steven Croll, Washington Post, June 5, 1995; Maryanne Weaver, New Yorker, June 5, 1995. 13. Brad White to the author, September 23,1995. 14. See Laurie Mylroie and James Ring Adams. "Saddam's Germs", The American Spectator, November 1995. 15. a1-Jumhuriyah, October 4, 1994. 16. al-Jumhuriyah, October 5, 1994. 17. al-Jumhuriyah, October 8, 1994. 18, Al-Iraq, April 11, 1995. 19. Al-Quds al-Arabi, June 15,1995. 20. This was suggested by Frank Gaffney in a Center for Security Policy "Decision Brief," July 7,1995. 21 "Saddam Nears End-game," The Guardian, September 4, 1995. 22. Telephone interview with Samarrai, in Damascus, September 1995. 23. McNeil-Lehrer Newshour, August 28, 1995. Americans, does it matter yet? If not, see #24. She was a guest tonight on Judith Regan's show - Judith publishes her books. She's not a dynamic speaker w/r/t 'style', but she gets an A on substance. Very interesting interview - I urge you to watch the repeat tomorrow night. ON SEPTEMBER 1, 1992, Ramzi Yousef arrived at JFK airport. He presented an Iraqi passport without a U.S. visa, was briefly detained (and fingerprinted) for illegal entry, and granted asylum pending a hearing. Our first misstake; he should have been deported automatically, then and there. Also added to watch list and refused any future visa, PERIOD. My understanding is that the 'watch list' was routinely ignored from one agency to another. Deportation (IMHO) should ALWAYS be the first option - it's our responsibility to protect our borders FIRST - then worry about 'rights'. I am greatly troubled by the fact that our government has been spending money and time on saving some minnow in a stream, keeping prayer out of schools, disarming citizens, dumbing down our schools, allowing the social takeover of our institutions by radical feminists, the hijacking of our courts by ultra liberal judges - I could go on - rather than dealing with the REAL problems facing all countries - protecting borders and providing a strong defense. For 8 years we couldn't be bothered with this type of information - our beloved media spent thousands of man hours on OJ, boxers or briefs, interns and cigars - not Chinese money, giving away satellite technology, our 'can't we all get along' foreign policy with Arafat and Adams. How many people know about the disappearing laptops in the state department? Or the naked woman found dead in the state department? Or - well, there's a pattern, but then it's all the product of the vast right wing conspiracy. 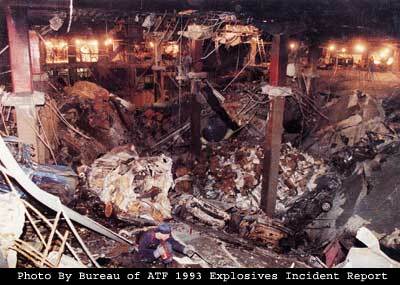 why did the fbi not allow salem to render the wtc bomb inert? You couldn't be more right! WTC would never have happen if we just enforced our own laws. What does a visa mean? It's a ticket to in. You should NOT get in if you don't have a ticket. If you try to get in without a ticket once, you should never get a ticket. Something tells me that many other countries handle this correctly, and many more will in the future. http://www.lectlaw.com Not for commercial use. Solely to be used for the educational purposes of research and open discussion. ...the bomb went off, on--let it be well noted--the second anniversary of the ending of the Gulf War. Thanks for the kind words ratcat. God bless. "New York law enforcement suspected Iraqi involvement. The World Trade Center bombing occurred on the second anniversary of the Gulf War cease-fire. According to the authorities, many Iraqis were peripherally involved. In fact, the last remaining fugitive charged in the bombing is an Iraqi. He came from Baghdad and fled back to Baghdad. In addition, the bomb produced a huge effect. Americans may not really realize how big it was because most of the damage was to the basement floors. The bomb left a crater six stories tall. Jim Fox, who headed New Yorks FBI bureau then and led the investigation in New York, once told me thatafter a hard days work searching for evidencehe would often sit and relax at the edge of the crater, stare down into the enormous hole, and ask himself, "Who the hell did this?" I'm glad you said it. Nowadays, when you say things like that, somebody pulls the thread. The same dang thing happened with Atta! You're making my brain hurt this afternoon, but thanks for taking the time to post this. Very damning. You're making my brain hurt this afternoon, but thanks for taking the time to post this. Thanks. It just keeps going on and on and on and on. It's like a federal government corruption template. I mean, the FBI just now decides to check Atta's car and residence for the presence of the deadly bacterium. If it wasn't so serious, it would make me laugh. In response to reports that the FBI had overlooked leads tying Twin Towers kamikaze hijacker Mohamed Atta to the recent wave of anthrax attacks on the U.S., the bureau now plans to test Atta's rental car and Florida residence for the presence of the deadly bacterium. The decision to probe a possible Atta anthrax connection, first reported by Fox News Channel late Saturday, comes after a report last week that the FBI had specifically declined to sweep Atta's car and home for traces of the bioterror agent. "In Florida, agents haven't tested cars or residences used by some of the hijackers, including those of Mohamed Atta," the Wall Street Journal revealed Thursday. "FBI officials said testing isn't a priority, because they assume that by now, the hijackers' cars and apartments would have been cleaned, removing any trace of anthrax." "At this time, there are no plans to go back and check [Atta's car and apartment] for traces of anthrax," Special Agent Rene Salinas told the paper just four days ago. The FBI has previously tested Atta's other personal effects, such as clothing he left behind, for anthrax traces. Weeks before the Sept. 11 attacks, Atta and several of his fellow hijackers were spotted at Florida airfields inquiring about renting cropdusting airplanes, a move investitigators suspect may have been linked to bioterrorism. Atta was also reportedly spotted in a Florida pharmacy with reddened hands, a symptom some say could have been caused by anthrax contamination. I had heard this "report" and found it as unbelievable as them blaming a US right wing "hate group". I have had the feeling that they really didnt want to know the truth.. The fatal error the US government made was prosecuting Ramzi Yousef as a mere criminal instead of looking into whether he was a state back terrorist. At this point, it doesn't appear the current administration wants Iraq to be involved, so this connection will continue to be dismissed as mere speculation. Bttt! Thought you might be interested in this. Too late..............I just got new glasses. It's not our eyes; it's trying to cram all this information into our brains! if you see or hear anything that threatens our national security. was established by the 1984 Act to Combat International Terrorism, Public Law 98-533.
and they are assured complete confidentiality. Rewards, totaling millions of dollars, have been paid in dozens of cases. Innocent lives have been saved and terrorists put behind bars. I almost fell off my chair laughing at this one. I agree. I hate to see this site become a bigger govt./'at least it's not clinton' site. I also noticed that you seemed to be fighting alone on some threads. You aren't alone. "In January 1995, Yousef and his associates plotted to blow up eleven U.S. commercial aircraft in one spectacular day of terrorist rage." Interesting. for one, shows, again, that the FBI is not interested much in the whole turth, but winning percentage of court room victories. I've seen this before. Thanks for the reminder ping! Bring this back to the top. Very important article. Mylroie is a great American. Thanks. Good post for later reading.